An interesting announcement issued this week from Midem, the Cannes-based music industry conference. QTrax, the long-rumored startup indicates that it will go live with a P2P model approved by the major labels offering 25 million tracks of audio content. All ad supported. After years of fighting peer-to-peer file sharing companies, the major record labels have decided that if they can't beat them, they might as well join them -- in one case, anyway. At the MIDEM conference in Cannes, QTrax announced deals with all of the major music labels and publishers to offer the first free and legal ad-supported P2P service to include major label music. "You can't change the attitudes and habits of what is now probably amounting to two generations who believe that music ought to be free on the internet," said QTrax CEO Allan Klepfisz. "Those people are not going to be discouraged by Supreme Court decisions, they're not going to be discouraged by technological interference. Ultimately, what will discourage them is a demonstratively better service." Klepfisz pegs the catalog of the service over 25 million songs, which would dwarf those of iTunes and other online music stores. The songs will be wrapped in Microsoft's Windows Media subscription DRM. 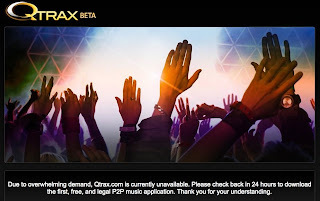 This means that unlike the free, ad-supported services offered by imeem and Last.fm, QTrax's songs can be downloaded onto compatible players. The application is based on the Songbird engine, so sharing and downloading occurs within a Firefox browser -- no separate application required. As of now, the tracks are not compatible with the Apple iPod, but Klepfisz said that the service would be compatible with iPods before too long -- an indication that Apple could apply the subscription technology developed for iTunes Movie Rentals to the music market.